His performances with Barcelona’s OSB were live-broadcasted on the RNE Spanish radio, and he has premiered and recorded Turnage’s Cello concerto KAI for the MDR channel. He is also in charge of the cello solos in the movie about architect Norman Foster (How much does your building weight, Mr. Foster?). Born in a family of musicians (father Marc Bleuse is a composer, and mother Anne Fondeville an opera singer), Emmanuel received his first cello lessons by famous pedagog Annie Cochet. Also a student of Phillipe Müller, he completed his superior studies in Germany at the Musikhochschule in Freiburg im Breisgau, in the class of Christoph Henkel, graduating in 1999 with the highest awards. That same year, he won the competition for the “Bourse Lavoisier Foundation Scholarship”, which allowed him to study with Janos Starker at the Indiana University Bloomington (USA), where he obtained the Performer Diploma in 2000. During master classes, Emmanuel Bleuse also received advice from Natalia Gutman, Bernard Greenhouse, Lluís Claret, Wolfgang Boettcher, Gary Hoffmann… He has won First Prize in the competition “Matinées Musicales” in Indianapolis and the “Prix de l’Académie Ravel”. From 2000-2004 Emmanuel Bleuse was the 1. solo cellist in Halle’s Philharmonic Orchestra, now holding the same position in the OSIB in Spain. He is a faculty of the Superior Conservatory in Palma de Mallorca, also invited to give masterclasses in the Beijing Central Conservatory. 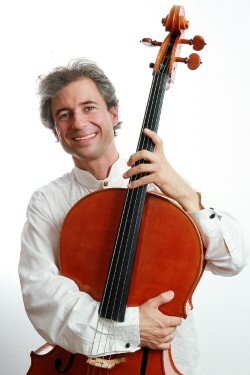 Emmanuel Bleuse performs on a 1997 Vatelot cello.